For anyone who loves The Handmaids Tale or Greek Mythology. This story of the Trojan War told by Achilles' "prize" concubine Briseis is totally compelling and reminds us that Margaret Atwood's dystopian "future" is actually the past and present for many women throughout history. 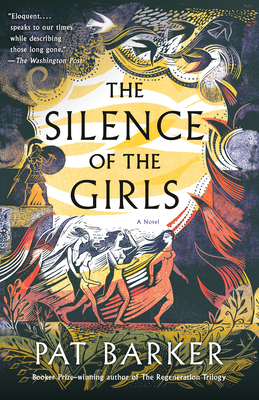 From the Booker Prize-winning author of the Regeneration trilogy comes a brave and masterful retelling of The Iliad, as experienced by the captured women living in the Greek camp in the final weeks of the Trojan War. The ancient city of Troy has withstood a decade under siege of the powerful Greek army, who continue to wage bloody war over a stolen woman--Helen. In the Greek camp, another woman watches and waits for the war's outcome: Briseis. She was queen of one of Troy's neighboring kingdoms, until Achilles, Greece's greatest warrior, sacked her city and murdered her husband and brothers. Briseis becomes Achilles's concubine and must adjust quickly in order to survive a radically different life. When Agamemnon, the brutal political leader of the Greek forces, demands Briseis for himself, she finds herself caught between the two most powerful of the Greeks. Keenly observant and cooly unflinching about the daily horrors of war, Briseis finds herself in an unprecedented position to observe the two men driving the Greek forces in what will become their final confrontation, deciding the fate not only of Briseis's people, but also of the ancient world. &nbsp;&nbsp;&nbsp;&nbsp; Briseis is just one among thousands of women living behind the scenes in this war--the slaves and prostitutes, the nurses, the women who lay out the dead--all of them erased by history. With breathtaking historical detail and luminous prose, Pat Barker brings the world of the Greek camp to vivid life. She offers nuanced, complex portraits of characters and stories familiar from mythology, which, seen from Briseis's perspective, are rife with newfound revelations. Barker's latest builds on her decades-long study of war and its impact on individual lives--and it is nothing short of magnificent. PAT BARKER is the author of Union Street, Blow Your House Down, The Century's Daughter, The Man Who Wasn't There, the Regeneration trilogy (Regeneration, The Eye in the Door, and The Ghost Road, which won the Booker Prize), Another World, Border Crossing, Double Vision, and the Life Class trilogy (Life Class, Toby's Room, and Noonday). She lives in Durham, England.